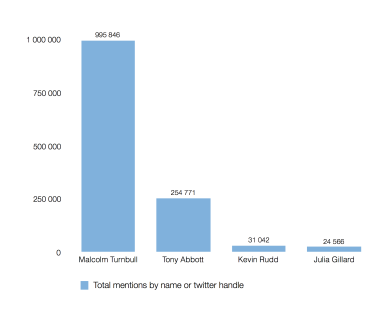 On the front page of the Australian Prime Ministers site we chart the last 100 days’ activity on Twitter, tracking public tweets which mention current and recent prime ministers (both full names and twitter handles) as well as the hashtags #auspol and #qanda. We harvest around 40 000 tweets every day: we’re at over 7 million total at the time of writing. For this analysis, we’re using exactly 5 million tweets from 8 December 2015 to 22 May 2016. It’s a huge amount of data. Printed out, 5 million tweets would fill 100 000 pages, a stack of A4 paper 10 metres tall, weighing almost half a tonne. The current Prime Minister has significantly more tweets directed at or written about them than the previous PMs, which is unsurprising given the media attention they enjoy (or, more often, endure). Twitterers can use hashtags to categorise or identify one or more topics for their tweet. The hashtags arise organically from community usage: some hashtags such as #auspol or #ausvotes, are used to connect to the broad conversation; some relate to State politics; others such as #panamapapers are more targeted, and reflect concerns of the day. 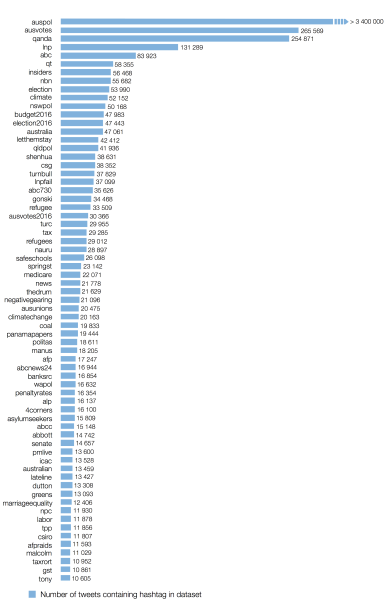 67 hashtags appear in more than 10 000 tweets. There are 258 129 individual user accounts represented in the dataset, but over half have tweeted just once (some are “sock puppet” accounts, computer-generated for marketing or other purposes: others are very real). 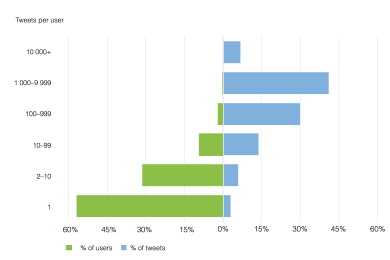 At the other end of the spectrum, the 915 users with more than 1 000 tweets each have contributed 48% of all tweets. This power law distribution is common in online communities. Our dataset doesn’t contain tweet locations, but most Australian political tweeters will be on the eastern seaboard. 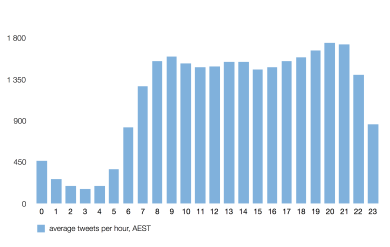 Tweet volumes are relatively consistent during daylight hours, with slight bumps at breakfast, lunch and late evening. The late-evening results are skewed by the #qanda hashtag, which has a very significant uptick during the hour on Monday evening when its TV show is aired. Michael Honey is the founder of Icelab, a design and development studio working with MoAD to build Australian Prime Ministers.